For the sweetened and flavored alcoholic beverages, see Liqueur. For the novel series, see Liquor (novel series). Liquor (also hard liquor, hard alcohol, spirit, or distilled drink) is an alcoholic drink produced by distillation of grains, fruit, or vegetables that have already gone through alcoholic fermentation. The distillation process purifies the liquid and removes diluting components like water, for the purpose of increasing its proportion of alcohol content (commonly expressed as alcohol by volume, ABV). 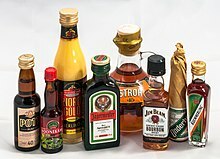 As liquors contain significantly more alcohol, they are considered "harder" – in North America, the term hard liquor is used to distinguish distilled alcoholic drinks from non-distilled ones. The term "spirit" refers to liquor that contains no added sugar and has at least 20% alcohol by volume (ABV). Liquor bottled with added sugar and added flavorings, such as Grand Marnier, Frangelico, and American schnapps, are known instead as liqueurs. Liquor generally has an alcohol concentration higher than 30%. Beer and wine, which are not distilled, are limited to a maximum alcohol content of about 20% ABV, as most yeasts cannot metabolise when the concentration of alcohol is above this level; as a consequence, fermentation ceases at that point. The origin of "liquor" and its close relative "liquid" was the Latin verb liquere, meaning "to be fluid". According to the Oxford English Dictionary, an early use of the word in the English language, meaning simply "a liquid", can be dated to 1225. The first use the OED mentions of its meaning "a liquid for drinking" occurred in the 14th century. Its use as a term for "an intoxicating alcoholic drink" appeared in the 16th century. The term "spirit" in reference to alcohol stems from Middle Eastern alchemy. These alchemists were more concerned with medical elixirs than with transmuting lead into gold. The vapor given off and collected during an alchemical process (as with distillation of alcohol) was called a spirit of the original material. Distillation equipment used by the 3rd century alchemist Zosimos of Panopolis, from the Byzantine Greek manuscript Parisinus graces. Early evidence of distillation comes from Akkadian tablets dated circa 1200 BC describing perfumery operations, providing textual evidence that an early, primitive form of distillation was known to the Babylonians of ancient Mesopotamia. Early evidence of distillation also comes from alchemists working in Alexandria, Roman Egypt, in the 1st century. Distilled water was described in the 2nd century AD by Alexander of Aphrodisias. Alchemists in Roman Egypt were using a distillation alembic or still device in the 3rd century. Distillation was known in the ancient Indian subcontinent, evident from baked clay retorts and receivers found at Taxila and Charsadda in modern Pakistan, dating back to the early centuries of the Christian era. These "Gandhara stills" were only capable of producing very weak liquor, as there was no efficient means of collecting the vapors at low heat. Distillation in China could have begun during the Eastern Han dynasty (1st–2nd centuries), but the distillation of beverages began in the Jin (12th–13th centuries) and Southern Song (10th–13th centuries) dynasties according to archaeological evidence. Freeze distillation involves freezing the alcoholic beverage and then removing the ice. The freezing technique had limitations in geography and implementation limiting how widely this method was put to use. The medieval Arabs used the distillation process extensively, and there is evidence that they distilled alcohol. Al-Kindi unambiguously described the distillation of wine in the 9th century. The process later spread to Italy, where later evidence of the distillation of alcohol comes from the School of Salerno in southern Italy during the 12th century. In China, archaeological evidence indicates that the true distillation of alcohol began during the 12th century Jin or Southern Song dynasties. A still has been found at an archaeological site in Qinglong, Hebei, dating to the 12th century. In India, the true distillation of alcohol was introduced from the Middle East, and was in wide use in the Delhi Sultanate by the 14th century. Fractional distillation was developed by Taddeo Alderotti in the 13th century. The production method was written in code, suggesting that it was being kept secret. In 1437, "burned water" (brandy) was mentioned in the records of the County of Katzenelnbogen in Germany. It was served in a tall, narrow glass called a Goderulffe. Claims upon the origin of specific beverages are controversial, often invoking national pride, but they are plausible after the 12th century AD, when Irish whiskey and German brandy became available. These spirits would have had a much lower alcohol content (about 40% ABV) than the alchemists' pure distillations, and they were likely first thought of as medicinal elixirs. Liquor consumption rose dramatically in Europe in and after the mid-14th century, when distilled liquors were commonly used as remedies for the Black Death. Around 1400, methods to distill spirits from wheat, barley, and rye beers, a cheaper option than grapes, were discovered. Thus began the "national" drinks of Europe: jenever (Belgium and the Netherlands), gin (England), Schnaps (Germany), grappa (Italy), borovička (Slovakia), horilka (Ukraine), akvavit/snaps (Scandinavia), vodka (Poland and Russia), ouzo (Greece), rakia (the Balkans), and poitín (Ireland). The actual names emerged only in the 16th century, but the drinks were well known prior to then. It is legal to distill beverage alcohol as a hobby for personal use in some countries, including New Zealand and the Netherlands. In the United States, it is illegal to distill beverage alcohol without a license. 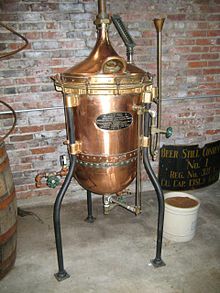 In some parts of the U.S., it is also illegal to sell a still without a license. However, all states allow unlicensed individuals to make their own beer, and some also allow unlicensed individuals to make their own wine (although making beer and wine is also prohibited in some local jurisdictions). 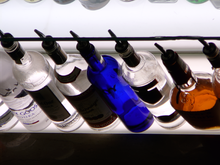 Some countries and sub-national jurisdictions limit or prohibit the sale of certain very high-percentage alcohol, commonly known as neutral spirit. Microdistilling (also known as craft distilling) began to re-emerge as a trend in the United States following the microbrewing and craft beer movement in the last decades of the 20th century. In contrast, large-scale distillation facilities were never as dominant in Scotland, so the tradition of small-scale distillation was never really lost in the Scotch whisky market. 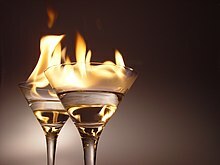 These flaming cocktails illustrate that some liquors will readily catch fire and burn. Liquor that contains 40% ABV (80 US proof) will catch fire if heated to about 26 °C (79 °F) and if an ignition source is applied to it. This temperature is called its flash point. The flash point of pure alcohol is 16.6 °C (61.9 °F), less than average room temperature. The flammability of liquor is applied in the cooking technique flambé. Up — shaken or stirred with ice, strained, and served in a stemmed glass. Down — shaken or stirred with ice, strained, and served in a rocks glass. The World Health Organization measures and publishes alcohol consumption patterns in different countries. The WHO measures alcohol consumed by persons 15 years of age or older and reports it on the basis of liters of pure alcohol consumed per capita in a given year in a country. Distilled spirits contain ethyl alcohol, the same chemical that is present in beer and wine and as such, spirit consumption has short-term psychological and physiological effects on the user. Different concentrations of alcohol in the human body have different effects on a person. The effects of alcohol depend on the amount an individual has drunk, the percentage of alcohol in the spirits and the timespan that the consumption took place, the amount of food eaten and whether an individual has taken other prescription, over-the-counter or street drugs, among other factors. Drinking enough to cause a blood alcohol concentration (BAC) of 0.03%-0.12% typically causes an overall improvement in mood and possible euphoria, increased self-confidence, and sociability, decreased anxiety, a flushed, red appearance in the face and impaired judgment and fine muscle coordination. A BAC of 0.09% to 0.25% causes lethargy, sedation, balance problems and blurred vision. A BAC from 0.18% to 0.30% causes profound confusion, impaired speech (e.g., slurred speech), staggering, dizziness and vomiting. A BAC from 0.25% to 0.40% causes stupor, unconsciousness, anterograde amnesia, vomiting, and respiratory depression (potentially life-threatening). Death may occur due to inhalation of vomit (pulmonary aspiration) while unconscious. A BAC from 0.35% to 0.80% causes a coma (unconsciousness), life-threatening respiratory depression and possibly fatal alcohol poisoning. As with all alcoholic beverages, driving under the influence, operating an aircraft or heavy machinery increases the risk of an accident; as such many countries have penalties for drunk driving. The main active ingredient of distilled spirits is alcohol, and therefore, the health effects of alcohol apply to spirits. Drinking small quantities of alcohol (less than one drink per day for women and 2 drinks per day for men) is associated with a decreased risk of heart disease, stroke, diabetes mellitus, and early death. Drinking more than this amount; however, increases the risk of heart disease, high blood pressure, atrial fibrillation, and stroke. The risk is greater in younger people due to binge drinking which may result in violence or accidents. About 3.3 million deaths (5.9% of all deaths) are believed to be due to alcohol each year. Alcoholism, also known as "alcohol use disorder", is a broad term for any drinking of alcohol that results in problems. It was previously divided into two types: alcohol abuse and alcohol dependence. In a medical[clarification needed] context, alcoholism is said to exist when two or more of the following conditions is present: a person drinks large amounts over a long time period, has difficulty cutting down, acquiring and drinking alcohol takes up a great deal of time, alcohol is strongly desired, usage results in not fulfilling responsibilities, usage results in social problems, usage results in health problems, usage results in risky situations, withdrawal occurs when stopping, and alcohol tolerance has occurred with use. Alcoholism reduces a person's life expectancy by around ten years and alcohol use is the third-leading cause of early death in the United States. No professional medical association recommends that people who are nondrinkers should start drinking wine. While lower quality evidence suggests a cardioprotective effect, no controlled studies have been completed on the effect of alcohol on the risk of developing heart disease or stroke. Excessive consumption of alcohol can cause liver cirrhosis and alcoholism. The American Heart Association "cautions people NOT to start drinking ... if they do not already drink alcohol. Consult your doctor on the benefits and risks of consuming alcohol in moderation." ^ "distilled spirit - alcoholic beverage". Encyclopædia Britannica. ^ E. Gildemeister and Fr. Hoffman, translated by Edward Kremers (1913). The Volatile Oils. 1. New York: Wiley. p. 203. ^ Bryan H. Bunch and Alexander Hellemans (2004). The History of Science and Technology. Houghton Mifflin Harcourt. p. 88. ISBN 0-618-22123-9. ^ Levey, Martin (1959). Chemistry and Chemical Technology in Ancient Mesopotamia. Elsevier. p. 36. As already mentioned, the textual evidence for Sumero-Babylonian distillation is disclosed in a group of Akkadian tablets describing perfumery operations, dated ca. 1200 B.C. ^ Forbes, Robert James (1970). A short history of the art of distillation: from the beginnings up to the death of Cellier Blumenthal. BRILL. pp. 57, 89. ISBN 978-90-04-00617-1. Archived from the original on 20 December 2011. Retrieved 29 June 2010. ^ Taylor, F. Sherwood (1945). "The Evolution of the Still". Annals of Science. 5 (3): 186. doi:10.1080/00033794500201451. ISSN 0003-3790. ^ Hassan, Ahmad Y. "Alcohol and the Distillation of Wine in Arabic Sources". History of Science and Technology in Islam. Retrieved 2014-04-19. ^ Forbes, Robert James (1970). A short history of the art of distillation: from the beginnings up to the death of Cellier Blumenthal. BRILL. pp. 57, 89. ISBN 978-90-04-00617-1. Retrieved 29 June 2010. ^ Sarton, George (1975). Introduction to the history of science. R. E. Krieger Pub. Co. p. 145. ^ Holmyard, Eric John (1990). Alchemy. Courier Dover Publications. p. 53. ^ graf-von-katzenelnbogen.com, see entry at Trinkglas. ^ "Flash Point and Fire Point". Archived from the original on December 14, 2010. Retrieved March 6, 2011. ^ "Material Safety Data Sheet, Section 5". Retrieved March 7, 2011. ^ "Flash points of ethanol-based water solutions". Retrieved June 23, 2011. ^ Robert L. Wolke (5 July 2006). "Combustible Combination". Washington Post. Retrieved 27 January 2011. ^ Walkart, C.G. (2002). National Bartending Center Instruction Manual. Oceanside, California: Bartenders America, Inc. p. 104. ASIN: B000F1U6HG. ^ a b c d e O'Keefe, JH; Bhatti, SK; Bajwa, A; DiNicolantonio, JJ; Lavie, CJ (March 2014). "Alcohol and cardiovascular health: the dose makes the poison...or the remedy". Mayo Clinic Proceedings. 89 (3): 382–93. doi:10.1016/j.mayocp.2013.11.005. PMID 24582196. ^ "Alcohol Facts and Statistics". Retrieved 9 May 2015. ^ Hasin, Deborah (December 2003). "Classification of Alcohol Use Disorders". pubs.niaaa.nih.gov/. Retrieved 28 February 2015. ^ a b "Alcohol Use Disorder: A Comparison Between DSM���IV and DSM–5". November 2013. Retrieved 9 May 2015. ^ Schuckit, MA (27 November 2014). "Recognition and management of withdrawal delirium (delirium tremens)". The New England Journal of Medicine. 371 (22): 2109–13. doi:10.1056/NEJMra1407298. PMID 25427113. ^ Centers for Disease Control and Prevention. "General Information on Alcohol Use and Health". Retrieved 26 June 2008. ^ American Heart Association. "Alcohol, Wine and Cardiovascular Disease". Retrieved 26 June 2008. Blue, Anthony Dias (2004). The Complete Book of Spirits: A Guide to Their History, Production, and Enjoyment. New York: HarperCollins Publishers. ISBN 0-06-054218-7. Forbes, Robert (1997). Short History of the Art of Distillation from the Beginnings up to the Death of Cellier Blumenthal. Brill Academic Publishers. ISBN 90-04-00617-6. Multhauf, Robert (1993). The Origins of Chemistry. Gordon & Breach Science Publishers. ISBN 2-88124-594-3. Wikimedia Commons has media related to Distilled beverages.